It’s all about the view …. The Starter Castle Movement that has raped the Cape’s coastline since the late 1980s shows no sign of abating. The ongoing tear-down and replacement of the original inventory of old shingled summer mansions built at the turn of the 19th century with wedding caked, turreted displays of Pella windows and Chem-Lawned swards of grass is enough to make me launch into a jeremiad of nostalgia. The view has changed, at least for we peons who sail by and have to peer up at the messes, but for the wealthy waterfront homeowner, the view out the window towards Nantucket Sound remains as pristine as ever. No coincidence that this upper echelon of the public led the hue and cry against the construction of a wind farm three miles offshore: the thought of anything sullying their vistas broke out the checkbooks in a flurry of environmental hand wringing. Another thing that drives me nuts is the new obsession with outdoor lighting and the resulting light pollution. Some of these quaint $20 million haciendas are lit up like ocean liners at night, their balustrades and eaves covered with big honking spot lights to either deter pain-killer crazed burglars or show off the nitrogen-leeching Kentucky Blue Grass growing under the sprinklers. For someone on the opposite shore, the glare is beyond annoying and inspires fantasies of a Seal Team 6 sniper with a scope the size of a wine bottle. I’m convinced the clammers won the right to keep clamming thanks to the golf reference. Thirty years later and the current hypocrisy of the burghers of Popponesset Island has to remarked upon. Popponesset is in Mashpee — probably one of the most weirdly incorporated and developed towns in the State thanks to its historical status as the “reservation” of the Wampanoag Indian tribe. Property ownership and development in Mashpee has always had some controversy, with land titles clouded, ancient burial grounds unearthed as nitrogen-spewing golf courses are bulldozed, and the tribe constantly rattling the legal threat of reclaiming its ancestral lands. A commercial clammer — the term now is probably “aquaculturist” — sought permission from the Town of Mashpee to maintain a shellfish grant off the shores of Popponesset Island, a place my alma mater Forbes Magazine allegedly deemed one of the most affluent places in America thanks to an average household income of $250,000. He was given permission but the waterfront property owners swung into action, claiming, first and foremost, that the clamming operation would interfere with their view. Let’s keep in mind the waters are public property and aquaculture is a big business in most Cape towns, let alone the fact that clams are a sign of a healthy harbor. This is extremely ironic since their view is of Cotuit, where, thanks to the philanthropic efforts of one extraordinary old summer family and the Barnstable Land Trust, most of the southern shores of the town is pristine, undeveloped saltmarsh and pine forests. If you stand in Cotuit on those undeveloped lands — Ryefield Point or Crocker Neck — and look southwest across Popponesett Bay to the proposed site of the aquaculture grant (which is submerged and would be marked by a few buoys) you see Starter Castle after Starter Castle, some ablaze at night in a riot of floodlights, packed together, jetskis tied to the docks. Doing their best to poison the shore. “The view from any of the homes on Popponesset Island is nothing less than postcard-perfect. The picturesque island enclave boasts beautifully constructed homes and even more stunning natural views of the surrounding scenery. Home prices stretch into the millions, and in January the area was named one of the nation’s most affluent neighborhoods by Forbes magazine. Reaching the island requires a boat, or a drive over a one-lane bridge. It’s this off-the-beaten-path charm that attracted its affluent residents — and that has pitted a group of them against the Mashpee Board of Selectmen for approving a shellfish grant homeowners believe will destroy it. The head-shaking news that the Cotuit property of Frank and Jamie McCourt, (the battling divorcing destroyers of the Los Angeles Dodgers) is on the market for $50 million and knowing fate and circumstance, will probably be carved up into a nest of new McMansions by some developer/real-estate-agent-to-the-stars; the tear-down of Cotuit’s historic Hotel Pines; and the ongoing trashing of the harbors by human waste … Thirty years ago the preservationists of the Cape were warning the peninsula was on the road towards becoming the next Long Island. I fear we’ve arrived. Splendid post. I read about the proposed shellfish grant with interest since we keep our boat in Shoestring Bay, off Popponesset Bay. It is nice to see the dispute distilled so succinctly. I certainly hope the shellfisherman prevails. 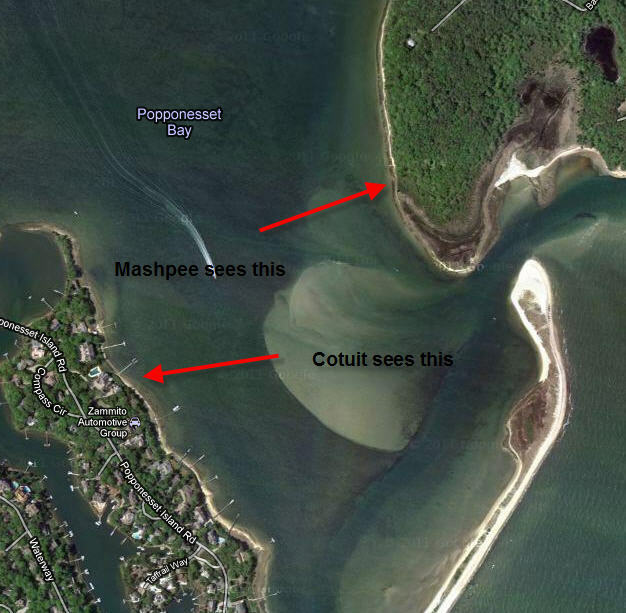 As a former investigative reporter, you might want to look into the politics of the development of Popponesset Island. I have heard rumors of bare-knuckled political horsetrading and shenanigans that even this former Chicagoan found quite amazing. Tax breaks achieved with promises later to be broken seemed the coin of the realm when this area was being developed; or perhaps it is all just rumor. Yes David, and the sad fact is that the Cape is, at some point, going to have sewage treatment facilities to preserve the bays and estuaries. And that seems like a good thing and something I support, but the downside is that once we do have a means of dealing with our waste, then the restrictions on lot size won’t matter any more and folks will be allowed to build homes on, what? 4,000 square foot parcels? Then it gets worse — like my hometown of Winthrop with similar zoning resulting from he presence of a sewage treatment system — subsequent home renovations, without adequate land, go UP. Three or four stories. Then, with more occupants, there are more cars and no place to park them. And so it goes . . . . .
One reason the Cape will never get as bad as Long Island: not enough New Yorkers. I always thought Whitey might be hiding out on the tacky back channels of Popponesset. Thank you for reminding me that a wonderful summer family has enriched us all with their conservation of a spectacular peninsula. My favorite trail run. Henry Parker Leonard built many of the homes on Sea View Avenue in Wianno including Kitty Foy’s place. He had just completed two houses and had lumber left over so he built it as a spec house. I met with Georges and Louie while I was down on the Cape. It was nice to see that Cape car traffic was far below what I had expected. Looks like there are quite a few of the houses for sale in Wianno and Osterville. I just hope they don’t become tear-downs that are replaced with ostentacious junk. I live in the View of this proposed project. This is about a man trying to make a buck on the backs of every taxpayer. Not to mention the wildlife that currently lives and feeds on that sandbar. Richard Cook is a politicaly connected man who ears enough money as an electrician to own 2 homes in town, one with a built in pool!!! Sorry, no sympathy from me Amy. Aquaculture is a beneficial activity that improves water quality, provides jobs, and insures that attention will be paid to the environment you so esteem. Your septic system and lawn fertilizer does more damage (unless you’ve converted to a composting toilet) than an oyster farm filtering thousands of gallons of hopelessly over-nitrogen laden water in Popponesset Bay.